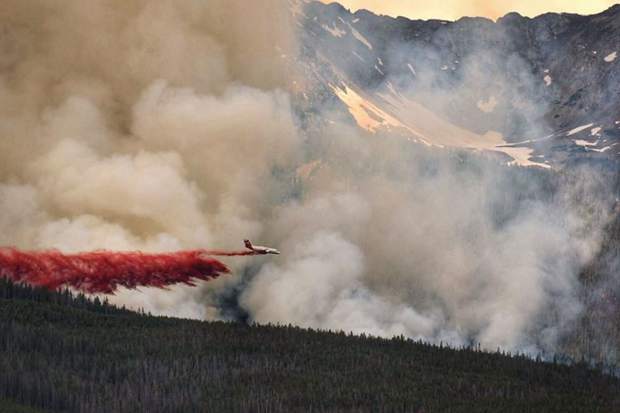 An air tanker dropped flame-retardant slurry on the Peak 2 fire on Wednesday, July 5, near Breckenridge. The final cost of the week-long fire response eventually reached as much as $2.3 million, though the total number remains unclear. The suppression effort surrounding the July Peak 2 fire near Breckenridge ultimately totaled more than $2 million, and Summit County and the U.S. Forest Service are now close to terms on who will foot which parts of the bill. On Tuesday afternoon at its regular meeting, the Board of County Commissioners unanimously approved kicking in as much as $400,000 out of its annual fire mitigation account as part of a cost-share agreement. The compact now heads to the sheriff — the individual who technically oversees county fire response as the statutory fire warden — for review before final feedback and approval through the Forest Service’s Dillon Ranger District. Who should cough up the coin to cover the week-long emergency response came into focus shortly after the human-triggered wildland fire on U.S. forestlands. Just 2 miles north of Breckenridge, it reached a comfortable containment percentage on July 11. What started on July 5 as a small brush fire rapidly expanded to an 84-acre blaze within striking distance of upwards of 450 homes that were evacuated in the Peak 7 area and necessitated a stepped-up Type I fire deployment to snuff it out. The first day of wildland fire response is often covered under some combination of preexisting mutual-aid agreements and state funding programs. After that, all bets are off and on what kind of land — county owned, forestlands or private property — matters greatly for who eventually pays the bill. Moreover, if for example it’s a wildfire on backcountry forestlands, often it will be monitored but not actually have massive resources poured into the cause because there aren’t vital assets to protect. With so many homes potentially in harm’s way and a desire to keep the fire from spreading to either the towns of Breckenridge — which for a period maintained a pre-evacuation order — and Frisco, the call was made to bring in one of the specialized crews often labeled the Navy SEALs of firefighting. The town of Breckenridge was not asked to contribute money because it does not hold jurisdiction on wildfires, while Breckenridge’s Red, White and Blue Fire Protection District provided an in-kind donation of $29,000 to the Forest Service by not billing for its services. The Summit School District charged a $1,500 fee for use of Summit High School as a fire command center, but not for its staff’s time or the use of Summit Middle School for operations. Ultimately, more than 400 total personnel mobilized to help on the Peak 2 fire, and that comes with costs that could take years to sort out entirely. Still, the Forest Service, with its tightening yearly budgets, didn’t want to be on the hook for what the best estimates currently forecast at between $2.1 and $2.3 million. The general belief is that more or less a 50-50 split of active suppression costs in such situation is good practice. The county operates with an annual fund of $1.8 million in place from a voter-approved 1A fund that started in 2010, with about 30 percent of that directed toward fire mitigation. That fund balance presently stands at $4 million, though only a quarter is specifically intended for fire work unless in an absolute wildfire emergency. Negotiations between the county and Forest Service eventually led to the sheriff’s office convincing the county board to fork over cash as part of the next three days of active suppression after initial response. That recommended placeholder amounts to $400,000, though once a couple state fire assistance funds are fully explored it could end up considerably less. While rough, the guess is that all said and done the total cost to the county would be in the mid-$200,000 range once as much as $100,000 is reimbursed by the state. The expenses from less intensive days of fire effort, as well as ongoing monitoring of the still-smoldering fire and future restoration work, will remain with the Forest Service once all the paperwork is signed and made official.